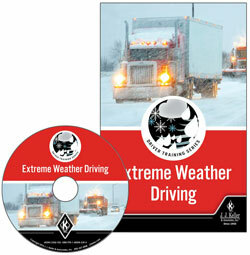 Provides drivers helpful guidance for handling extreme weather condition. Helps minimize crashes and incidents due to bad weather by demonstrating "what to do when bad weather strikes" to your drivers. (1) 21-Minute DVD - Combines engaging video and editing technology with expertise from industry professionals at all levels. (1) Trainer Guide - Product Code: 45592 (863-H) - Provides information on how to develop, organize, and conduct effective emergency maneuvers training sessions. (10) Driver Skills Cards - Product Code: 45598 (923-VC) - Recaps the key points from the training program and serves as a reference tool for drivers to use either before or after the training session.